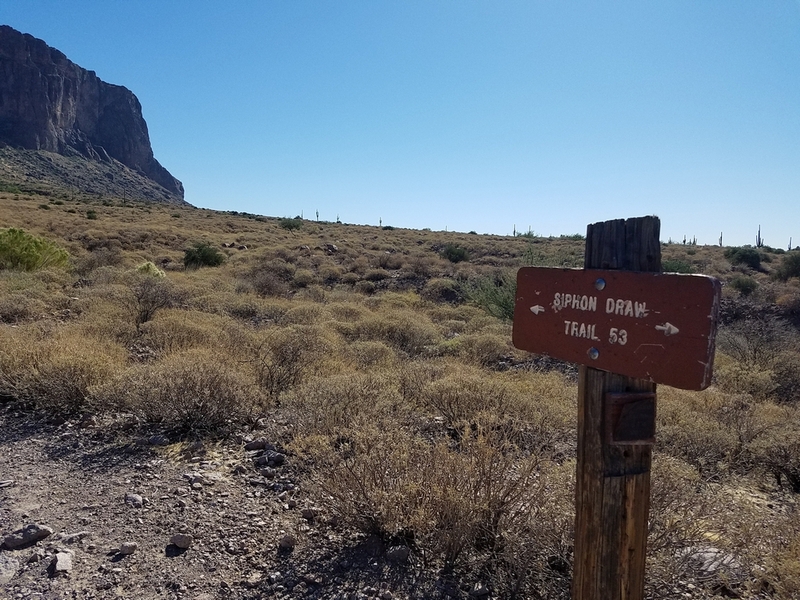 Siphon Draw is aptly named for its ability to “drain off” (i.e. 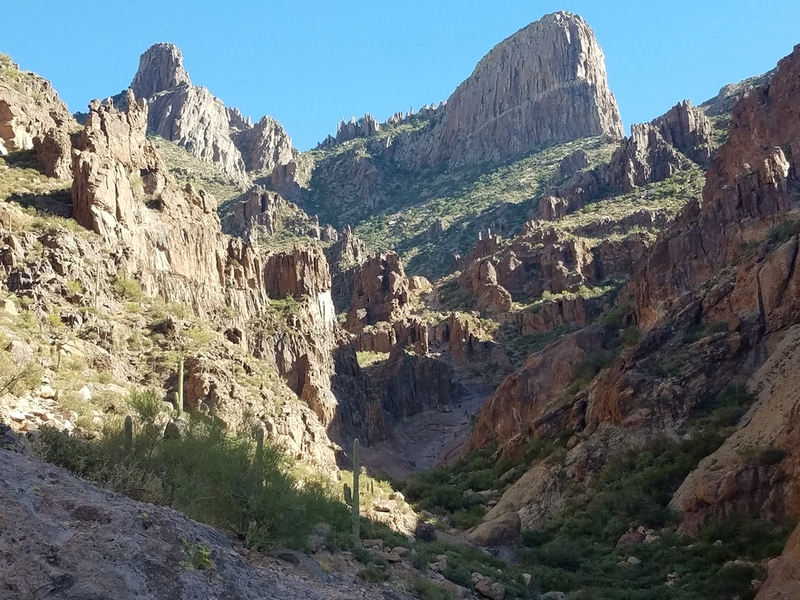 siphon) water from a large area on Superstition Mountains. 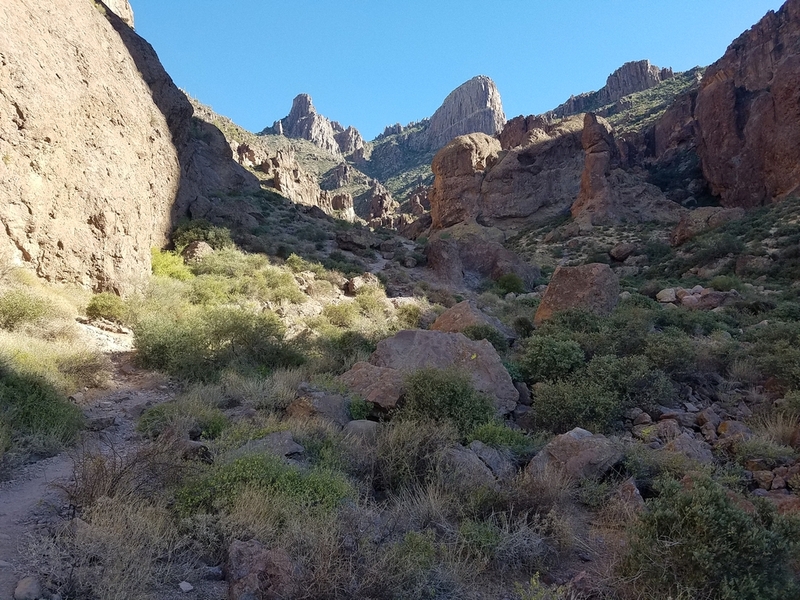 Just a light amount of precipitation will result in water being siphoned into the canyon draw and flow over the slick rock. 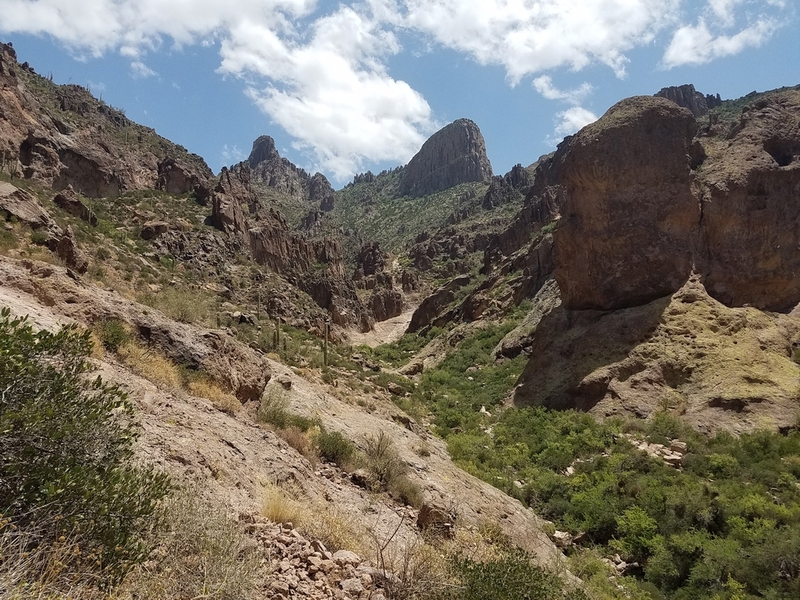 If you’re hiking Siphon Draw just after a rain, you will likely see waterfalls running through the basin, which is unique for southern Arizona hiking. 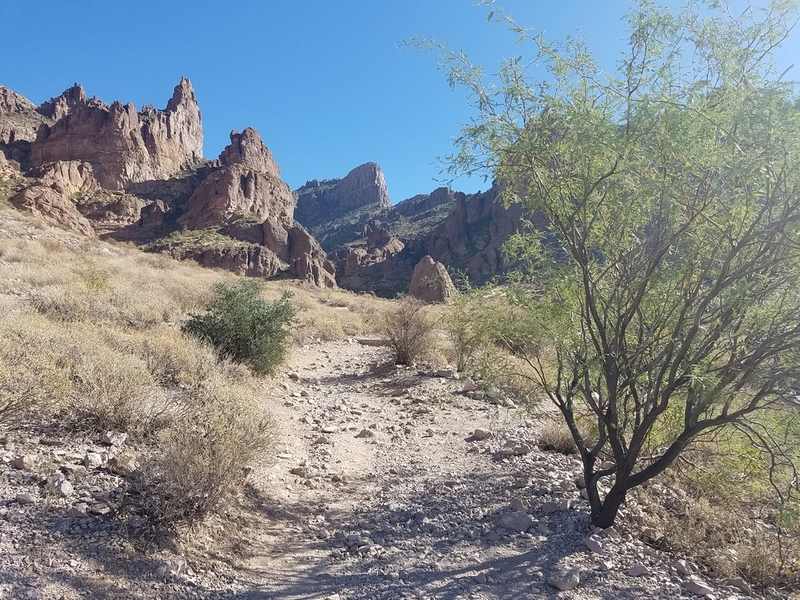 The hike begins at Lost Dutchman State Park in Apache Junction. 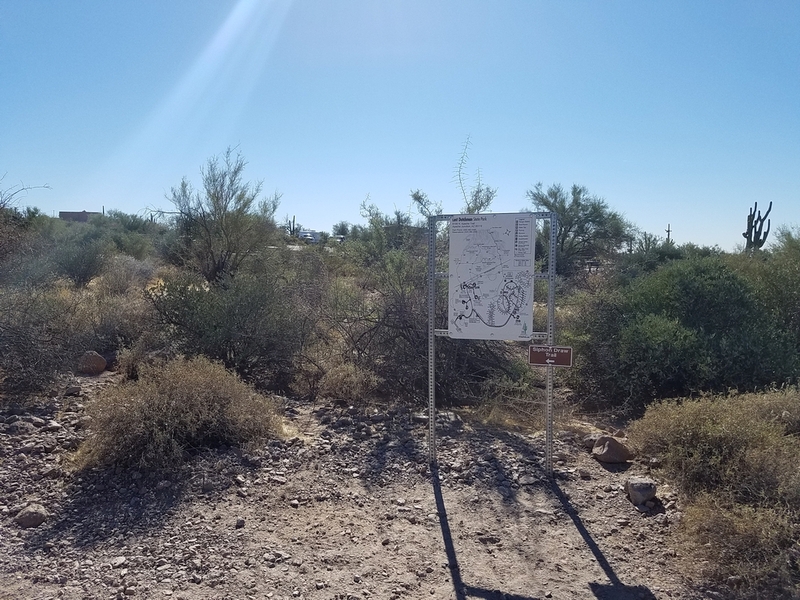 Once inside the park, drive to the last parking area and look for a sign for the Siphon Draw Trailhead. 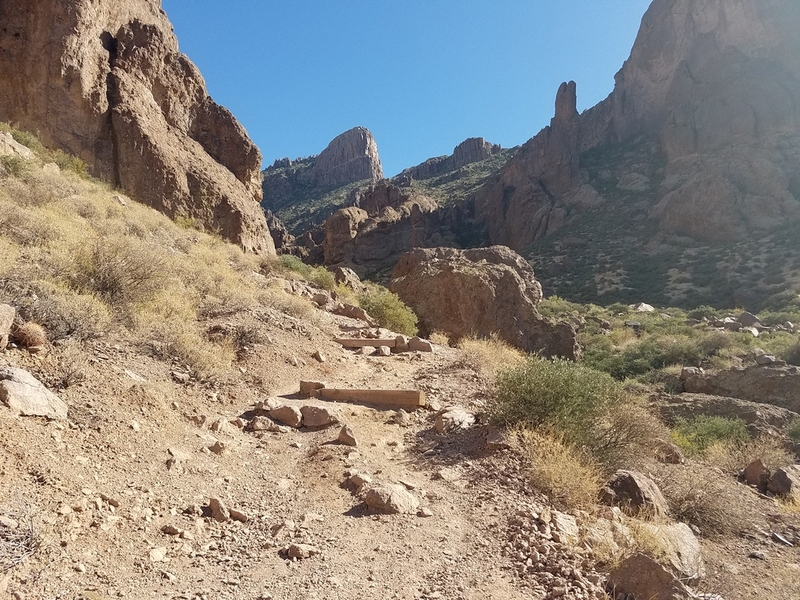 The trail is clearly marked and easy to follow for the first mile as you begin a gradual ascent to the basin, which sits at about 3,100 ft. elevation. 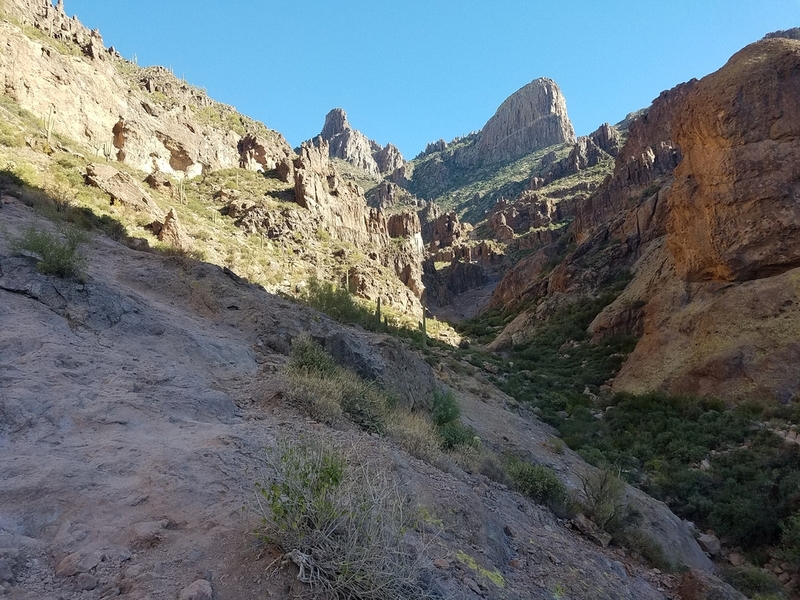 The Siphon Draw Trail rises through the bajada to the Jacob’s Crosscut Trail intersection (.85 miles : 2,215’). 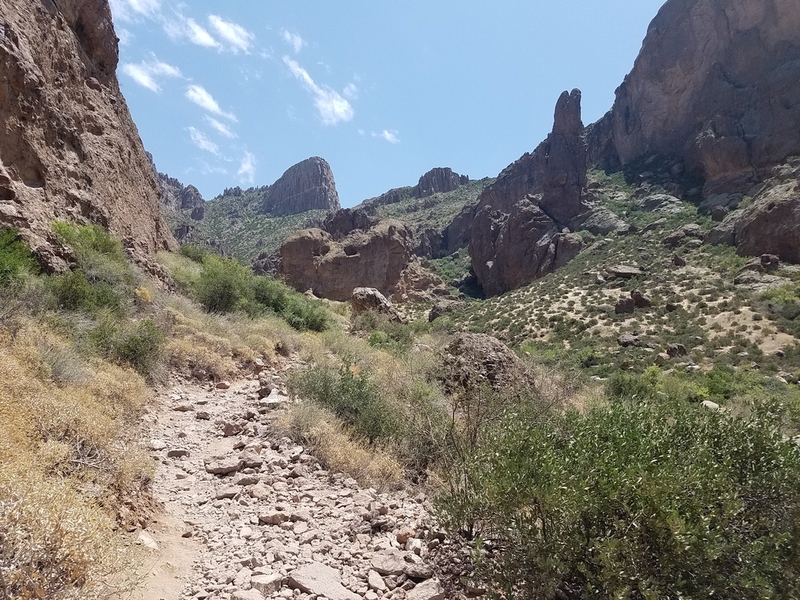 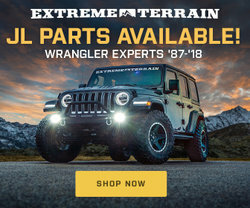 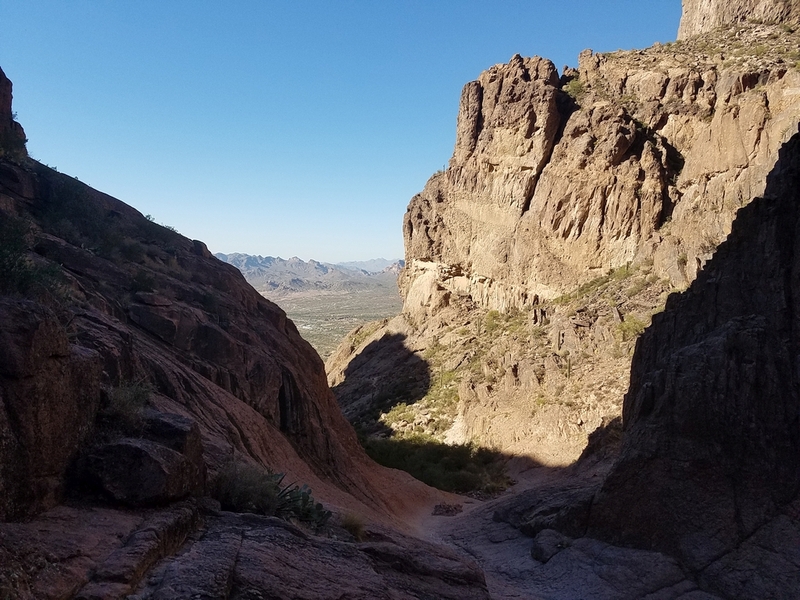 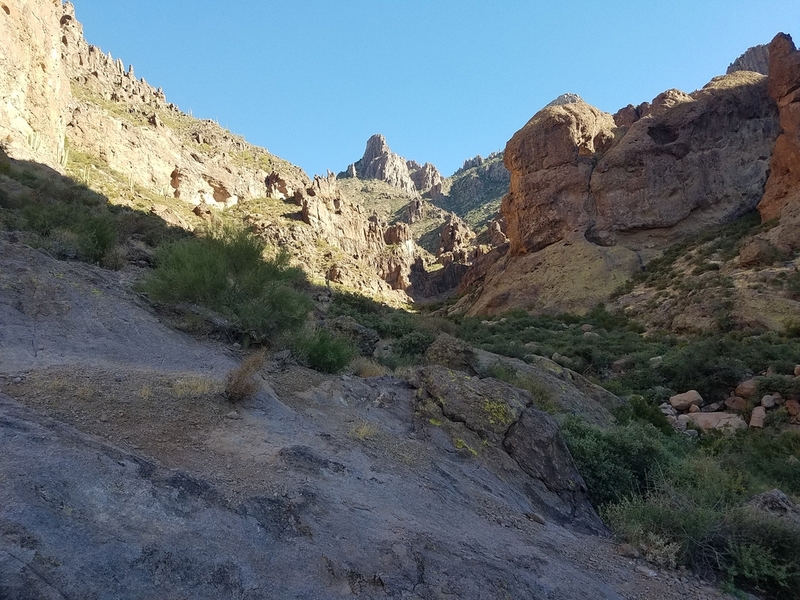 It continues on a steeper grade to the Superstition Wilderness Boundary at the foot of a high-walled gap in the mountain (1.35 miles : 2,550’). 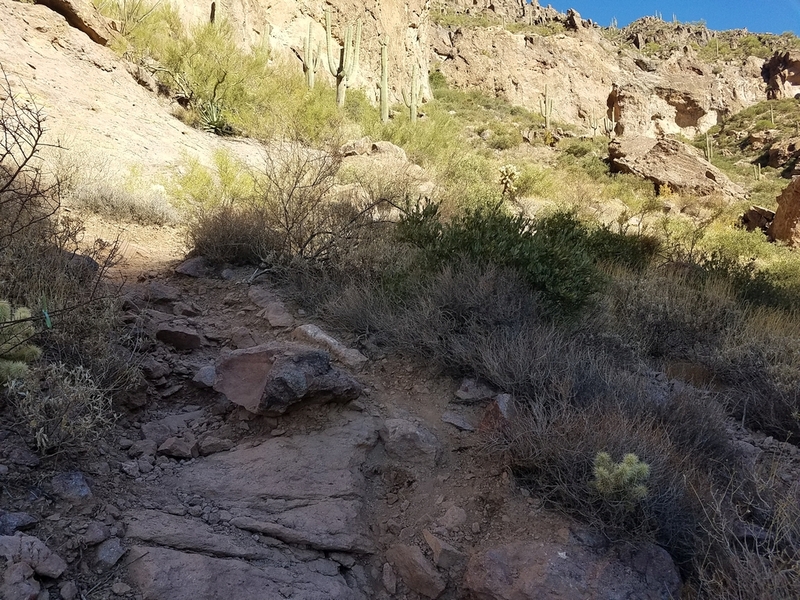 The trail heads into the gap on a markedly rugged path lined by thick brush to the base of a steep slickrock chute and The Basin (2.0 miles : 3,085’). 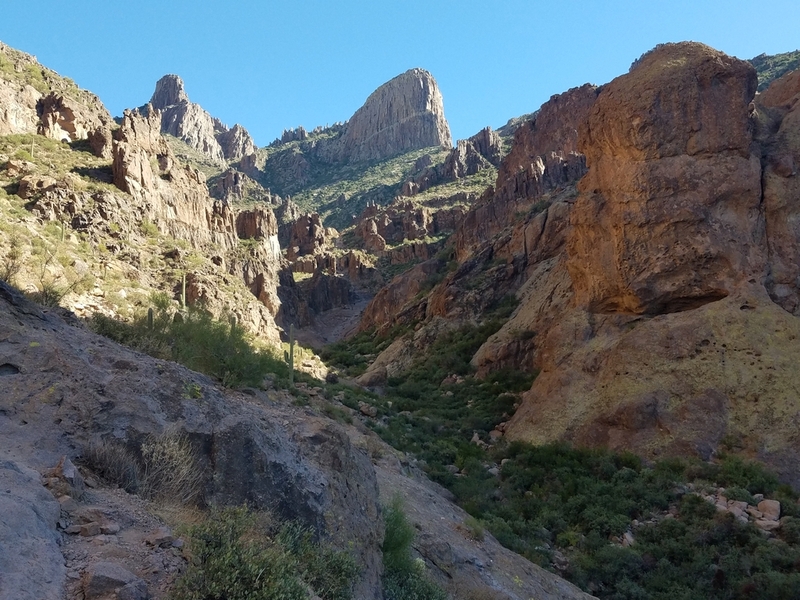 This shady slot offers great views across the bajada, and spire-topped walls of the canyon. 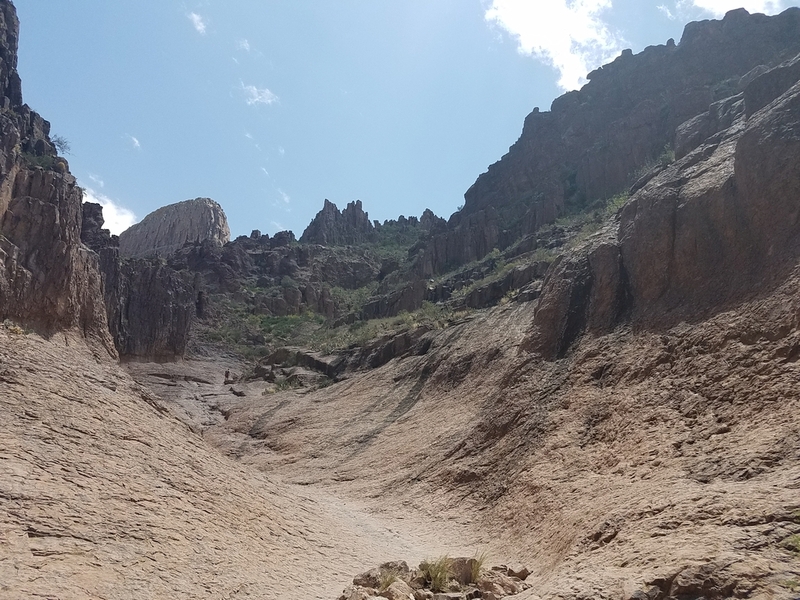 A seasonal waterfall trickles into a corner of the chute, which can make slickrock hazardous under heavy flows. 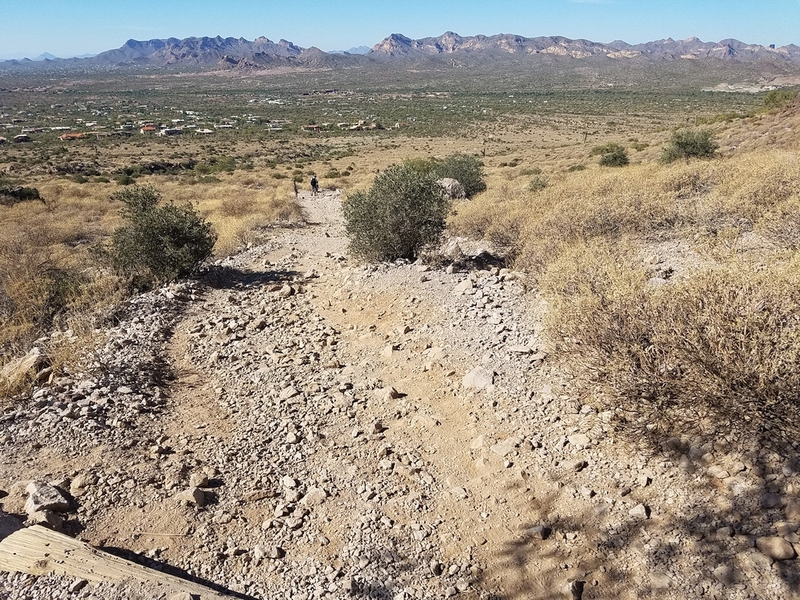 Note that the trail is not maintained past the Basin, which is the stop point for this trail. 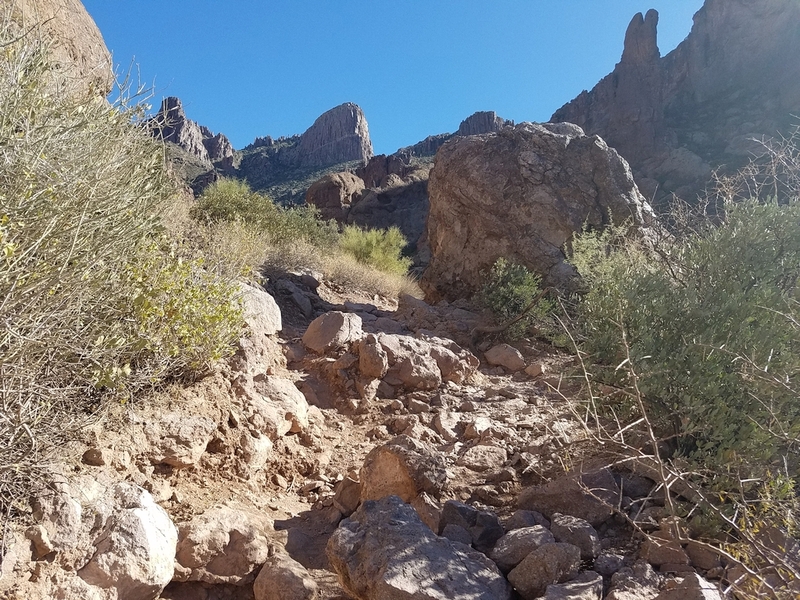 Only experienced hikers should attempt the full hike to the Flatiron as the trail is steep and difficult past this point. 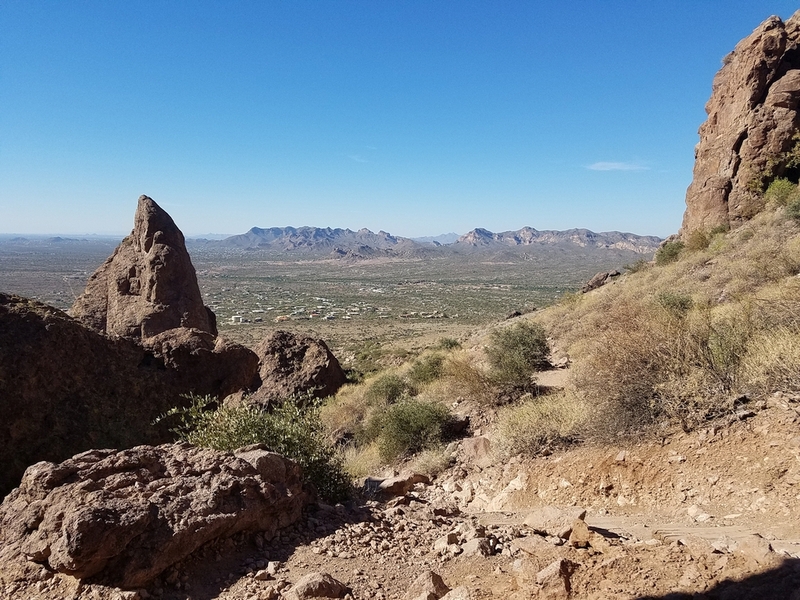 Whether you turn around at the rock Basin or make it to the Flatiron summit, you will not be disappointed by the ever changing rock formations, beautiful views, and rigorous workout! 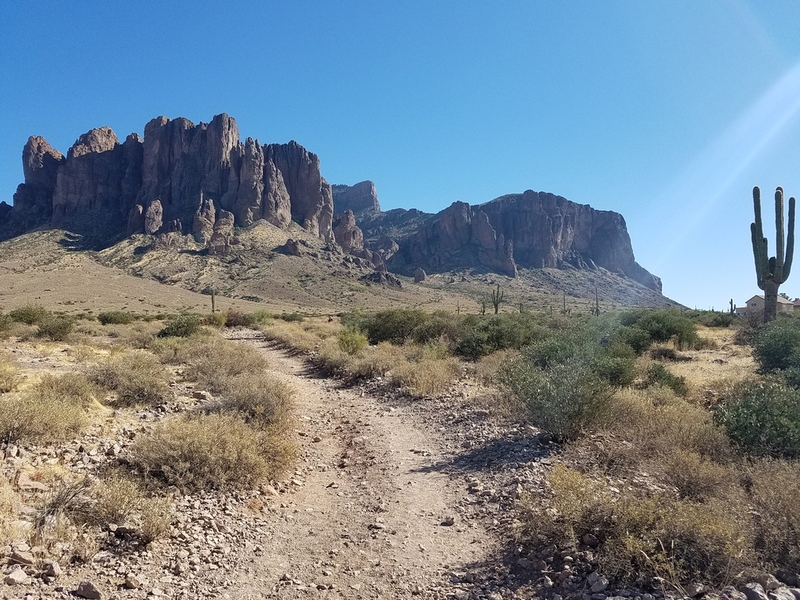 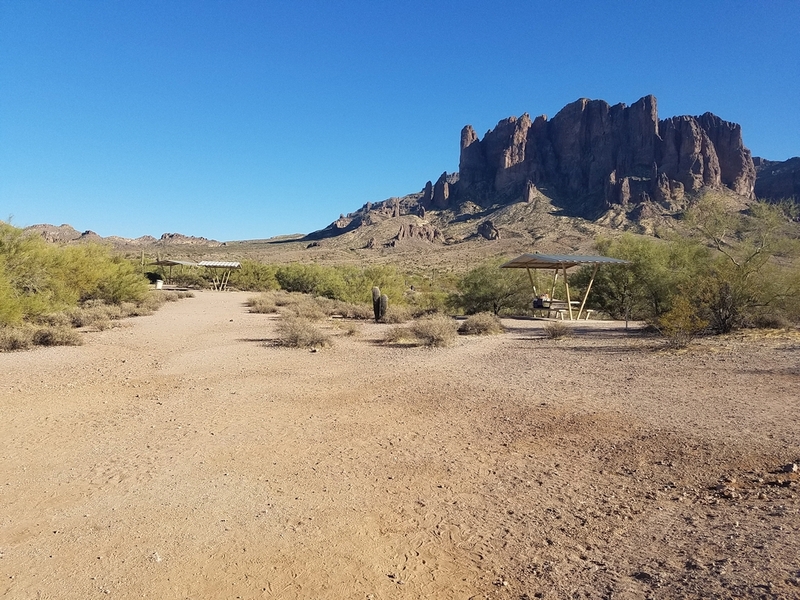 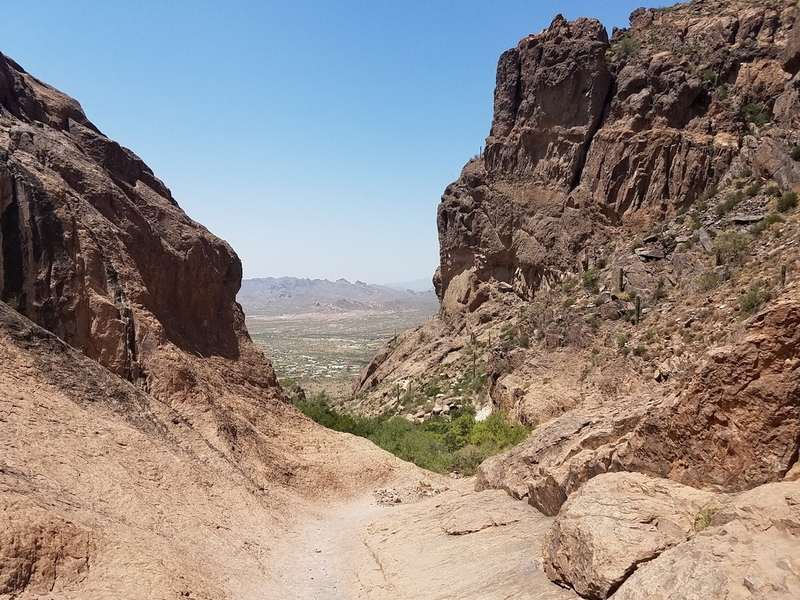 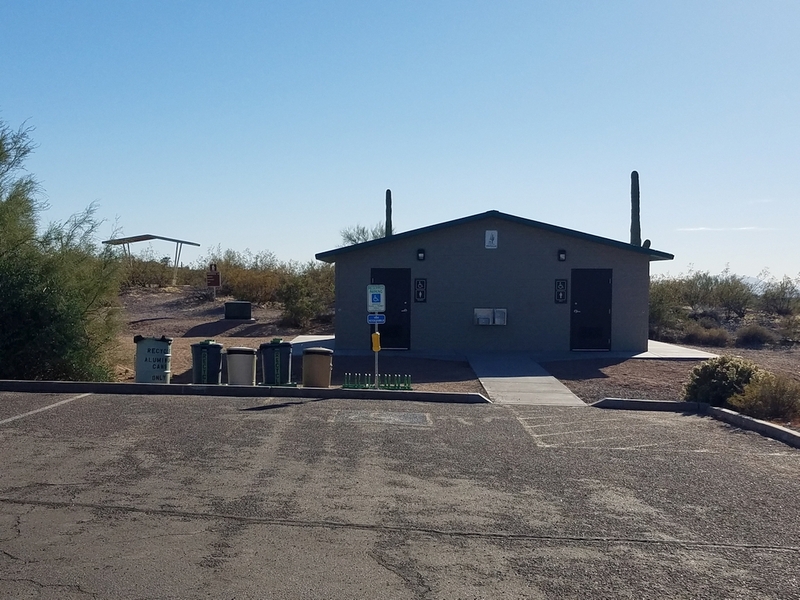 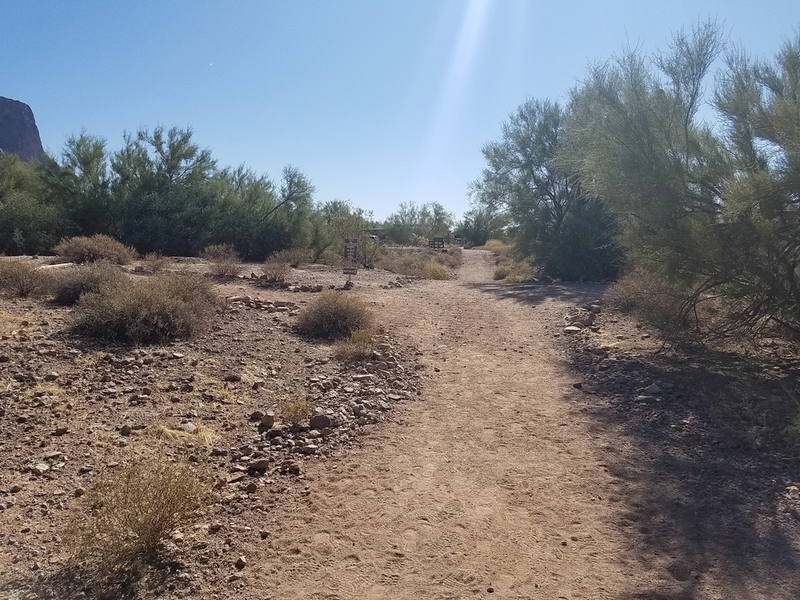 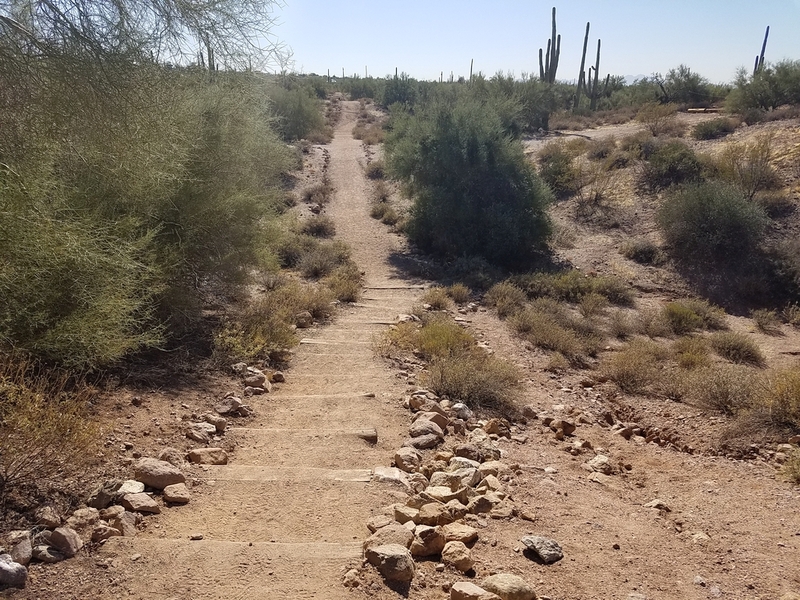 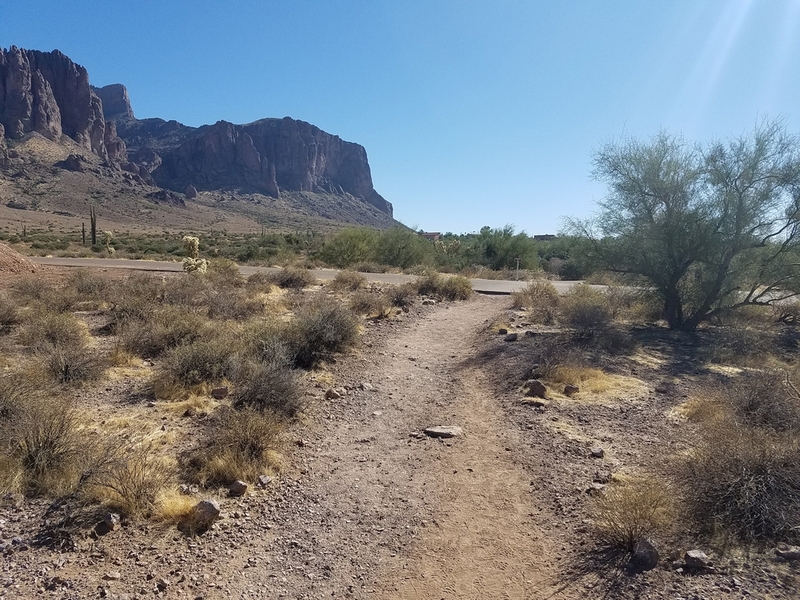 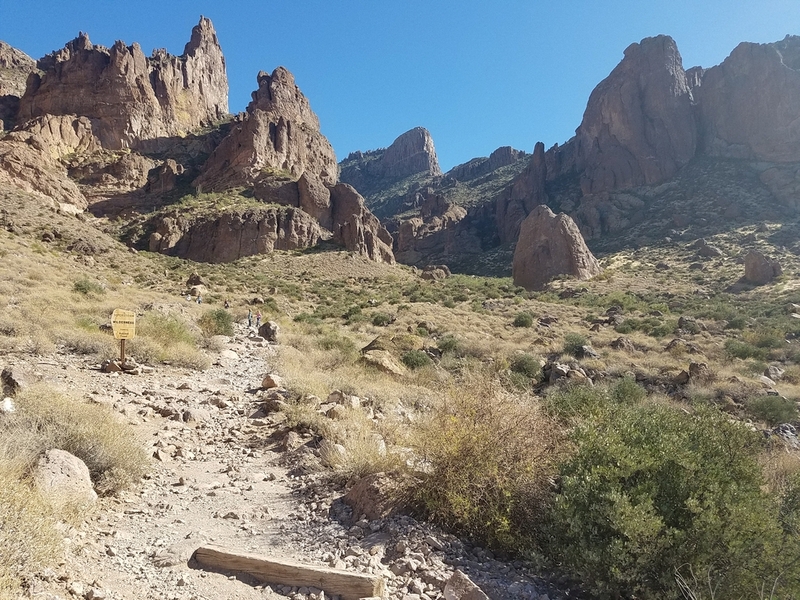 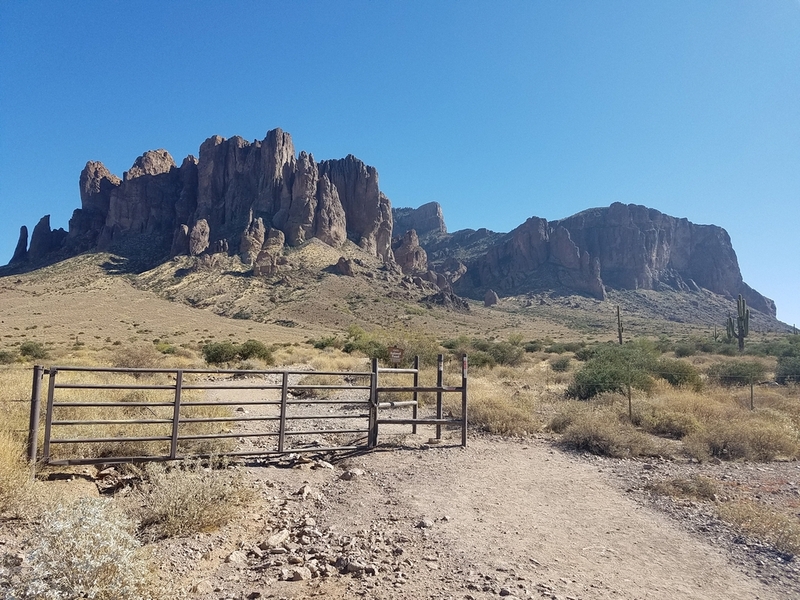 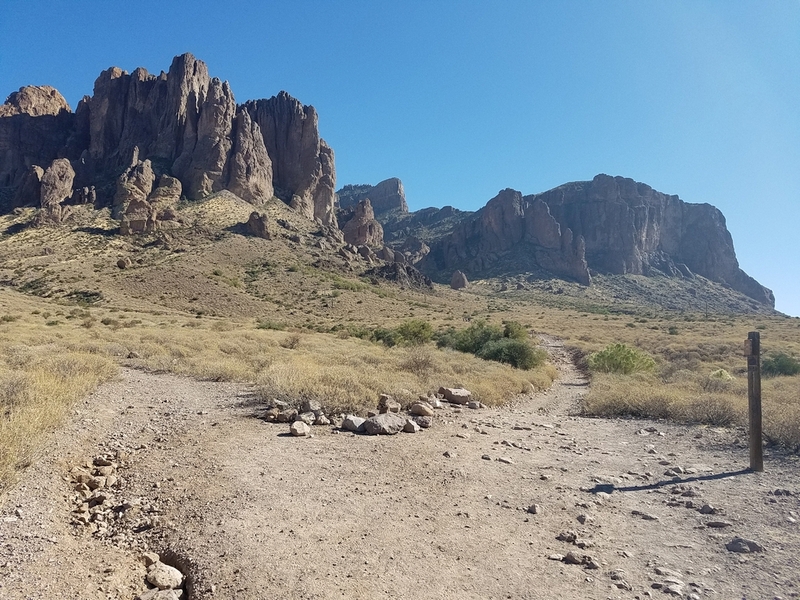 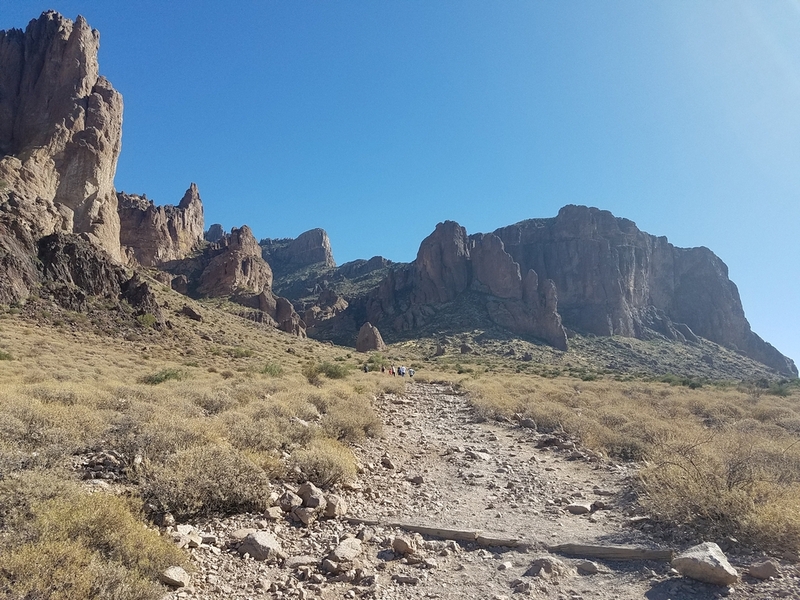 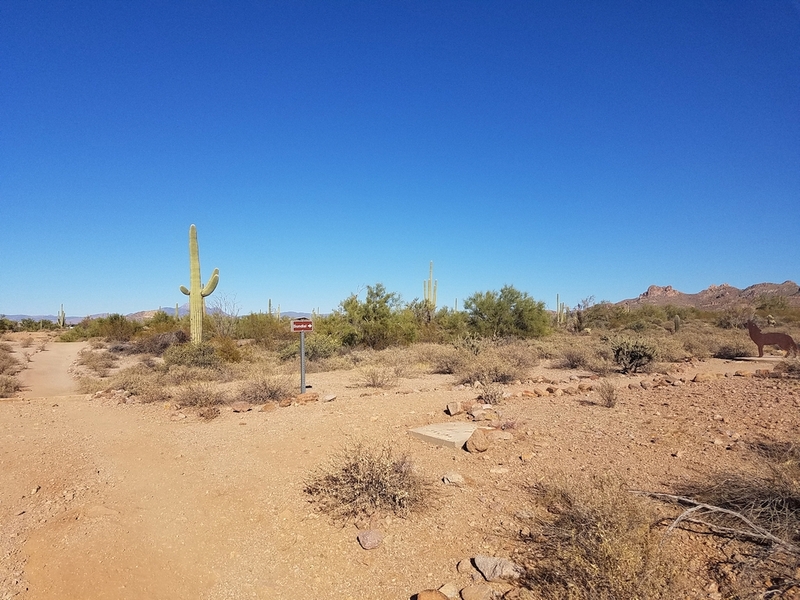 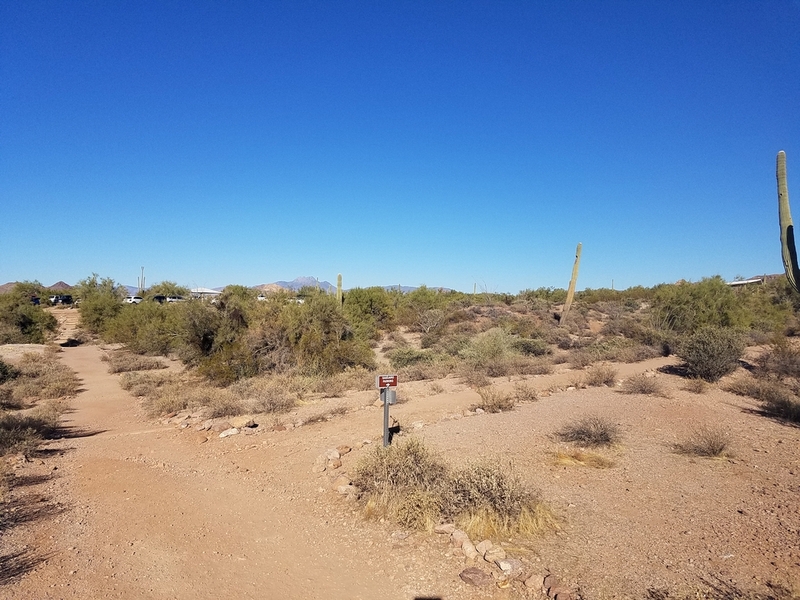 Lost Dutchman State Park offers both RV and tent camping if you’re planning a weekend getaway, and Apache Junction has a few restaurants and bars within 2-5 miles of the park entrance if you want to reward yourself after your hike.